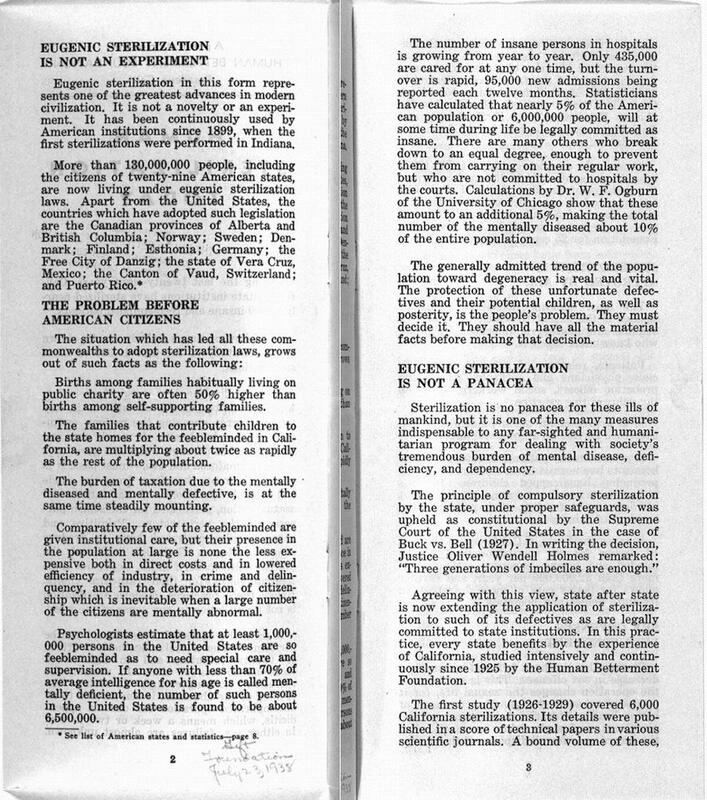 History of sterilization in California: Pamphlet from the Human Betterment Foundation. The Human Betterment Foundation, which operated in California between 1929 and 1942, researched the effects of eugenic sterilization and created and distributed literature arguing for the practice’s benefits. This 1938 pamphlet makes the case for state-imposed sterilization to readers who might have moral qualms, arguing that the practice was widespread, highly cost-effective, and approved by the families of the people who had been sterilized. California’s 1909 sterilization law, writes historian Alexandra Minna Stern, gave asylums and prisons the power to decide whether the operation would improve an inmate’s “physical, mental, or moral condition” and to carry it out accordingly. 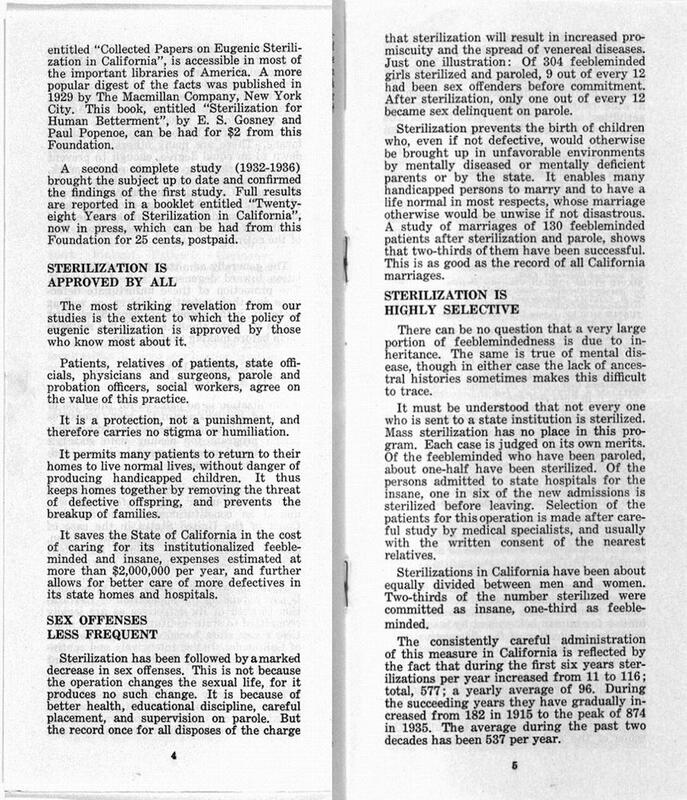 Revisions in 1913 and 1917 emphasized the eugenic intent of sterilizations, making it clear that physicians working in California institutions might choose to sterilize in order to keep what they diagnosed as a hereditary “mental disease” from being “transmitted to descendents.” About 20,000 people were involuntarily sterilized in California between 1909 and 1979. 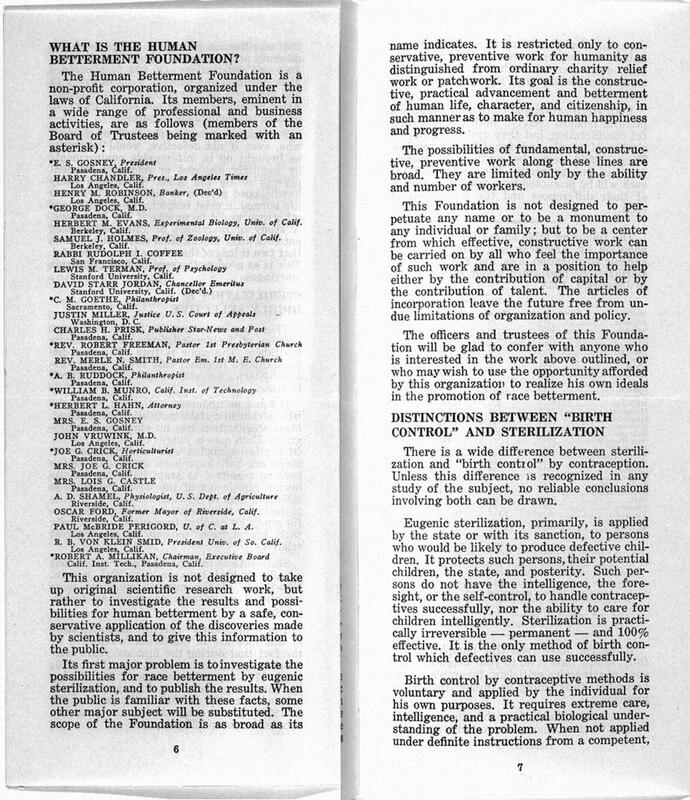 The list of members and trustees of the HBF, found on page 6 of this pamphlet, shows how utterly mainstream the idea of eugenic sterilization was during the 1920s and 1930s. E.L. Gosney, the founder of the HBF, was a lawyer, businessman, and prominent citizen of Pasadena. Gosney’s foundation was able to attract high-powered supporters like Lewis M. Terman (Stanford psychologist and pioneer in the field of intelligence testing), David Starr Jordan (founding president of Stanford), and Robert A. Millikan (Nobel-prize winning physicist and chairman of the Executive Council of Caltech).